Global Offshore Support Vessel Market size was valued over USD 40 Billion for 2016 and the cumulative fleet count is set to reach over 8000 by 2024. Robust increase in exploration and production along with availability of huge untapped deep-water hydrocarbon reserves will upsurge the market size. Depleting onshore reserves with positive outlook towards drilling activities primarily across deep-water will further complement the business outlook. The European Commission introduced old groundwater directive 80/68/EEC with an aim to control the flow of pollutant released during onshore drilling. As per EIA, in 2015, Saudi Arabia, Brazil, Mexico, Norway and the U.S. contributed 43% of total offshore oil production. Rising investment towards the restructuring and development of regasification terminals along with growing deployment of FPSOs and FLNG towards exploration of hydrocarbons will foster the market share. In 2013, Royal Dutch Shell has built 3.6 MTPA regasification unit with an investment of USD 12 billion which will commence the commercialization from 2018. Growth in subsea exploration activities along with rising energy demand will augment the market growth. Huge availability of hydrocarbons across remote areas with declining O&G reserves will further stimulate the product penetration. Mexico’s National Hydrocarbon Commission will organize two annual auctions in 2018 that will account for more than 2000 oil wells on the U.S. federal waters. Substantial rise in rig count along with the increasing demand for advanced drilling technologies will boost the AHTS offshore support vessel market. These products are specially designed to handle anchors, tow ships and serve as rescue vessel. In 2017, the U.S. oil rig count reached 759 as compared to last year that was 406, screening a hike of 86.95%. Growing demand for manned fixed platforms primarily for shallow water hydrocarbon production will embellish the market. As per Bureau of Safety and Environmental Enforcement, in 2015, the Pacific region has 23 oil and gas fixed platforms that account for 24 million barrels of oil and 47 cubic feet of gas annually. Declining operational cost coupled with increasing spending toward exploration and production will boost the shallow water offshore support vessels market. Low cost and limited technical integrities will further augment the business growth. As per EIA, in 2015, the share of offshore production from shallow water was 64%. Increasing deep-water and ultra-deepwater exploration along with technological advancement in drilling equipment will propel the market. As per U.S. Energy Information Administration, in 2015, the global oil production from deep-water projects reached 9.3 million barrels per day along with majority share from the U.S. and brazil in case of ultradeep production. Easy availability and low associated cost will embellish the fuel oil offshore support vessel market. Rising adoption by major shipowners will further boost the product demand. Available grades include IFO 380, IFO 180, MDO, MGO and residual fuel oil. As per Maritime and Port Authority of Singapore, in 2016, the fuel oil sales have reached to a record 48.6 million metric ton when compared to 45.2 million metric ton from 2015 level. 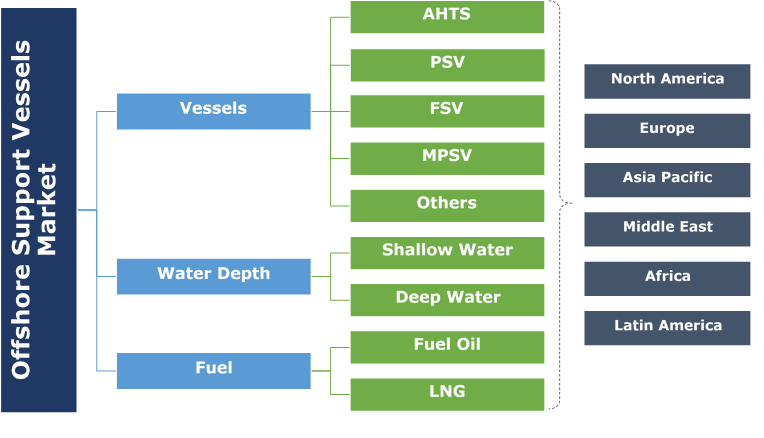 Shifting trend towards adoption of ecofriendly fuel subject to environmental concerns will drive the LNG fueled offshore support vessels market. Increasing production of LNG coupled with stringent government regulations will augment the industry landscape. Introduction of IMO Tier III norms to reduce NOx and sulfur content in oil will increase the demand for LNG as a ship fuel. 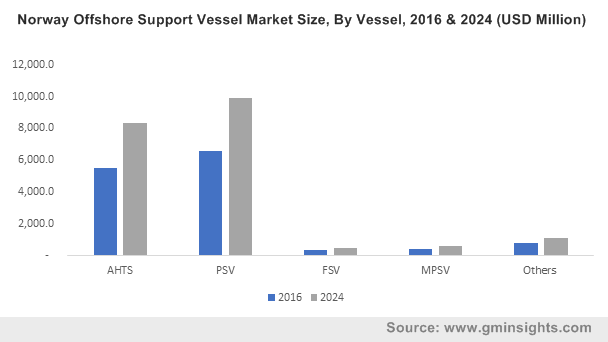 The U.S market is set to surpass 1900 OSV vessels by 2024. Advancement in technology coupled with expansion of deep-water projects will propel the product demand. In 2017, the U.S. Gulf of Mexico witnessed rise in production with 0.1 million barrels per day. Positive outlook toward shale exploration across the region will positively impact the industry growth. Increasing investment across deep-water oil fields will fuel the Norway offshore support vessel market share. In March 2017, Statoil announced to invest USD 2.34 billion in Norwegian deep-water projects. Availability of untapped resources will further stimulate the business landscape in the country. UAE market share is predicted to witness growth over 4% owing to the new oilfield discoveries. In November 2015, Abu Dhabi announced to develop new offshore oil and gas fields with an aim to increase output to meet growing oil and gas demand. Eminent players in the market include Maersk, Island Offshore, Edison Chouset, Solstad, Bourbon, Seacor Marine, Tidewater, Havila Shipping, Harvey Gulf, Vroon, Siem, REM Maritime, Farstad, Gulfmark Offshore and Swire. Major players are focusing on new product developments to gain the competitive advantage. Introduction of advanced technologies is the strategic move adopted by industry leaders. Harvey gulf has transitioned from a full-service provider for towing operations to specializing operator in jack-up and semisubmersible offshore service provider off the Gulf of Mexico. OSV are specially designed ships to be used for O&G exploration and production activities. AHTS are anchor handling and tug supply boats to be used near oil rigs and serves as rescue vessel. PSV supply equipment to the platforms with a variety of other tasks. FSVs are fast supply vessels that are a kind of crew boats to supply labor on platforms. MPSVs are multipurpose support vessels that are equipped with seismic survey instruments and other multipurpose facilities required during E&P activities.